Here’s a really cool idea for those who love camping. It’s called the Teal Camper. First off, in order to love this idea you have to an affinity for puzzles and assembly. That’s because the Teal Camper is a DIY lover’s dream. The camper arrives unassembled as a series of panels, and it the average person about 90 minutes to assemble this two person dwelling. When you’re done camping, simply break down the entire rig and store it in a small area. What an amazing concept. Lawrence Drake, the mastermind behind the rig, was influenced by family camping trips and cargo hauling. The idea was born in 2009 when his daughter wanted to go camping. He started to look for a pop up camper, but hated the idea of having to buy a truck to pull it. His own Chevy only towed 1,000 lbs. What he really wanted was something he could tow without having to buy a new truck. So he set out to solve this problem. Drake already owned a 4′ x 8′ utility trailer, and instead of permanently building a camper on top of it, he wanted to develop something he could assemble for a trip and then dismantle when he was done with it. That way he could use the utility trailer for camping, and also to haul things around town. 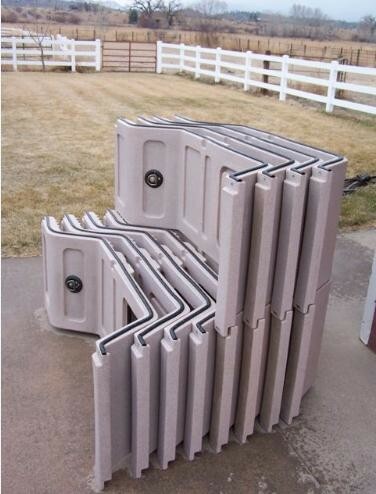 It took some research, but Drake eventually came up with his final idea for a modular camping unit utilizing sequential foam insulated polyethylene panels that could easily be assembled. Each panel is attached to the other with simple hardware and waterproof seals. Some of the panels have windows and doors. Need a taller roof? Drake created an expandable roof kit that lifts the roof to over 6 feet tall. 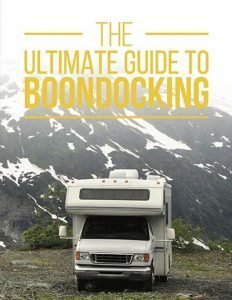 Using multiple angle brackets the body of the camper connects to the plywood floor of the utility trailer and is ready to roll. Drake’s big inspiration came when he realized the panels could actually be shipped to your home via a UPS truck, and all you needed to assemble your new travel trailer was a Phillips screwdriver. 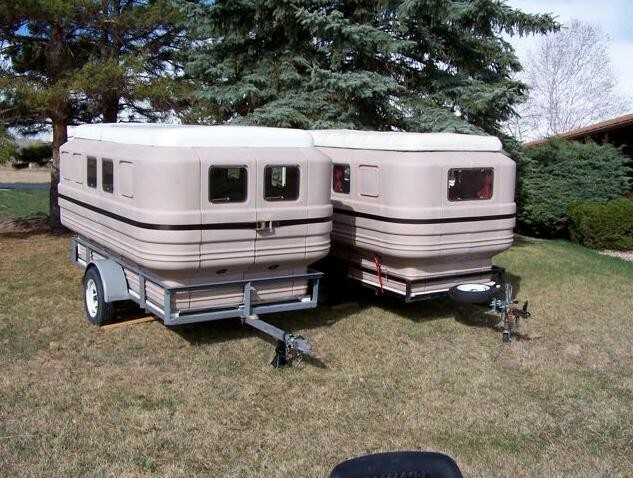 The trailer is easy to customize with extra window panels. Customization is something Drake is big on. After all, that’s why he created this modular camper in the first place. There are a few different versions of the Teal Camper. The Standard is limited to 1,000 pounds. 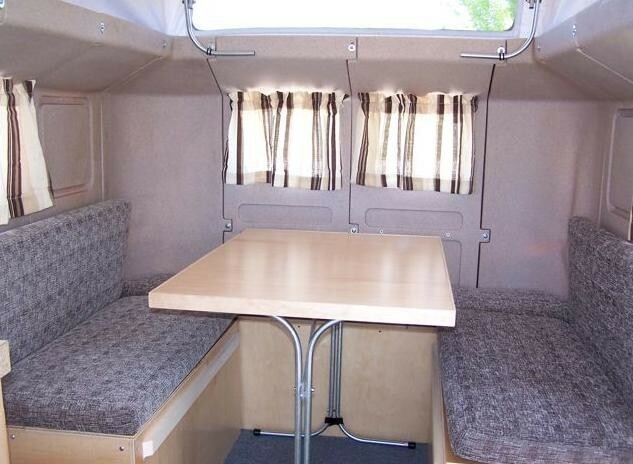 It includes basic bench seats, a table, and a double bed. Everything else is up to you. The basic idea was to develop a module camper with a low weight. Which means there is no cooking range or bathroom. However, you can make use of a camping stove and portable toilet. You can also purchase a canvas sink cabinet and use the minimalistic framing to customize the door. If you choose not to add anything extra, it is possible to carry large toys, such as ATVs or bikes inside the camper. The large double doors in the back made it easy to load and unload items. Don’t have a garage for storage? No problem. 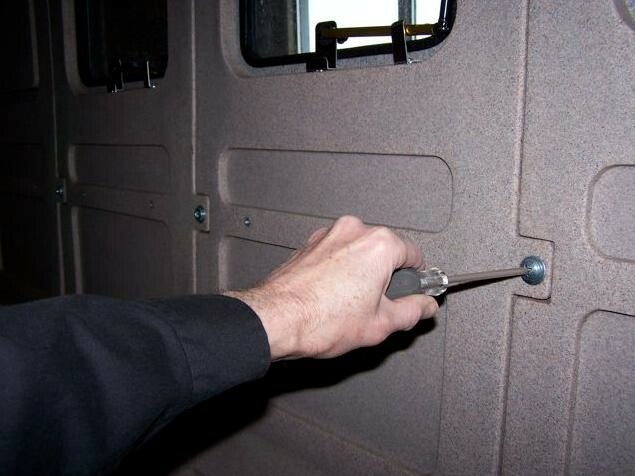 Simply disassembles the camper and stash is somewhere on the side of your house. The panels fit easily together for compact storage. Drake would like to set up a complete manufacturing company for his camper. He believes he has proven both demand and potential. Still, without venture capital, he has done all that he can do. He is looking for multiple investment and partnership options. For now, the Teal Camper is just a dream for the average person. Drake believes costs will range from as low as $3,000 to $5,000, without the trailer. Apart from the camper project, Drake believes the idea of panel system could be useful for other light weight shelter options. For an instance, the same Teal panels could be used for hunting blinds, emergency shelters, and ice fishing huts. May 16, 2015 – Teal International Corporation has entered into a five year agreement with an international company to produce shelters for that company’s exclusive use. The company’s application will be utilizing all the production capacity we have. While this is a great opportunity for us, unfortunately the shelters and campers will no longer be available for purchase. 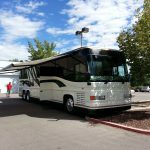 We will continue to carry repair and replacement inventory to service our existing customers who currently have our campers and shelters, but are restricted from selling any product to new customers. Thank you to all those who have followed our development over the years and supported us through emails, Facebook and our online store. What do you think? Would you have considered purchasing a Teal Camper? If so, why? 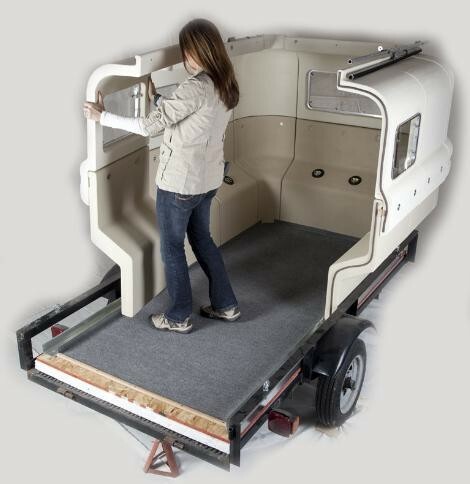 What features would you like or dislike Are you concerned about assembling your own camper? Like it or hate it, share your thoughts below. Now take a moment and share it with your friends. 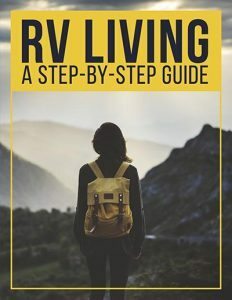 Tweet it, pin it, like it, or simply email your camping buddies this informative article. Thanks so much for reading!